I’ve known Hal for a few years now as she has gone more involved with CONvergence. Hal has always impressed me with her ability to use social media. She’s been working with Christopher Jones to help increase his visibility on Twitter and Facebook and it has, I think, made a big difference in his visibility to his fans. She can seem a little quiet when you first get to know her. I assume she is just sizing people up because once she knows you a little better, she is opinionated and passionate. When she has an opinion on how to improve something, she is not quiet about that opinion in the least. I like that she will push her agenda to others. She isn’t shy about making her position known and trying to affect change. 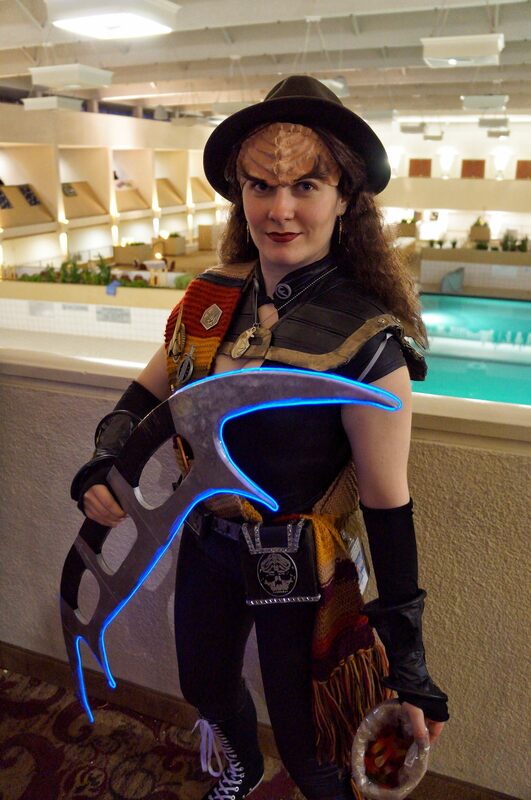 As the picture of her Klingon Dr. Who costume would indicate, she’s also an imaginative cosplayer and she really seems to get a lot of pleasure from that activity. When it comes to her involvement in fandom, I think she is really all in. She is always looking to immerse herself in the experience. She goes to a lot of conventions, cosplays, works with CONvergence, and really seems to embrace the community. Working with her on the convention, one of the things I appreciate is her ability to be direct and succinct. When she asks for something, she does so clearly. She doesn’t try to sugar coat a request. She also understands if a request can’t be accommodated. Her dealings with others are a lot more professional than one will find in a community of volunteers. She treats the volunteer position like a job. I think we could all learn from that and strive to be a bit more professional in our dealings with one another. I’m pleased I’ve gotten to know her better over the last few years. Hal is, in a word, awesome.